"We however think that pu-erh must be kept without oxygen. Therefore our tea is packed without oxygen even if we need to spend extra effort in packing. First of all, the primary reason why pu-erh tea is compressed is to ensure that there is no oxygen inside the tea leaves. 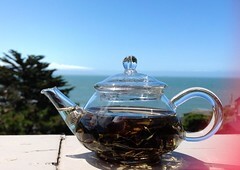 Those ancient people in Yunnan has known that in order to get tea matured nicely, it is essential to remove oxygen. Similarly, Taiwan oolong is sometimes kept without oxygen. With this method, the original floral flavor of the high mountain oolong becomes a distinctive peachy flavor after being kept for 3-5 years. For pu-erh tea, the same theory is also feasible." This goes against all expert advice which recommends the cakes need to breath to age- not too much but a modicum amount of airflow. Experts also recommend putting beengs in airtight storage to stop further process of fermentation. I tend to buy kimchi in vacuum sealed bags from Korea and I can tell you first hand serious fermentation continues to occur. Actually if you have ever experienced an exploding jar of kimchi which was packed and sealed tight, you know what hojotea has to say is not untrue. Bioactivity in pu-erh probably requires only thimblefuls of air. I feel this could be a way for me to beat the low humidity in Berkeley. I'd somehow have to wait until it's about 60% humidity when the cakes are at an ideal level, then put them in airtight heat sealed mylar bags maybe using nitrogen preservation. Well, I had better just start with the used resealable mylar bags I have for my other teas. Following hojotea's argument, storing shengs in airtight packaging with sufficient moisture should solve the lack of ambient humidity no? I must experiment for myself but if anyone has any experimental results already, please let me know. vendor David Duckler of Verdant Tea for the hyper-inflated price of his Star of Bulang in the comments section of this post so you can decide for yourself. He says his cake is premium and "Our markup is extremely low." However MarshalN confirms for me that YongMing is a low-end vendor and their 2006 cakes don't go for more than 100RMB(~$15) in China. Regardless, $156 for a 2006 sheng would make it probably one of the most expensive in the world, esp. for a Bulang which does not have the market hype of Lao Banzhang or Yiwu coming from a factory which lacks any premium brand recognition. Is this $150 Yong Ming Star of Bulang really 10x times better than the $10 version? 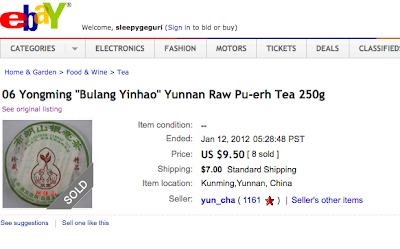 Just as a comparison, Essence of Tea is selling 1998 Heng Li Chang Bulang for ~$180. So I am back to the conundrum of looking for aged sheng on the internet. I would buy from Guang of Hou De but his "Aged Puerh" section is a little thin with four entries right now so Essence of Tea is my next best bet. I do have a friend visiting San Francisco from Hong Kong so this would be a last resort. All weekend I was down with a wee bit cold so my plans for a proper tea tasting was blown with an impaired olfactory system. Even the lovely shus I felt good about earlier this week tasted just like boring old shu- comforting yes but without the ability to pickup the layers of sarsaparilla and caramel notes, I just felt like an old Chinese man quaffing restaurant tea to clean my pork loving greased up pipes. Then a light bulb when off in my head. Your olfactory receptor cells degrade as you age- almost everything in the body appears to do so except a sense of humor. Perhaps it's not worth waiting even a decade for your sheng to age. You should taste aged shengs when your taste buds are their height because the flavors may not be as vivid when the time comes around. Maybe in the world of sommeliers- like professional athletes- there must be a peak to their olfactory prowess. As our bodies fall apart, you might have to start taking pharmaceuticals and suffer "dry mouth" and other indignities and perhaps not be able to enjoy the nuance of a ripe sheng. I had better present this new brilliant argument to my husband and procure some aged stuff pronto! I took a selection of teas for our friend Irish Karl who planned for us a delicious smoked pork shoulder lunch. Karl being an imbiber of much harder stuff than tea enjoyed only the imperial Yunnan golden tips. Actually I have yet to find anyone who doesn't like imperial Yunnan, but the shu tasting just did not fly. Karl who is the king of Irish patois was so taken aback by the ripe earth taste of shu that he could only sputter words like "vile" and "nasty" prefixed liberally by "fookin". Pu-erh is an acquired taste for many western palates. Otherwise Thomas Lipton would have made a fortune off of it centuries ago. Numi teas is trying to introduce pu-erh to the west with blending it with more familiar flavors of Earl Grey and chocolate, but I think their success is marginal. I tried the Numi bottled pu which they were giving away for free during the Oakland Street Food Festival last year and it was brewed so weakly, I'm not sure you could call it pu-erh. Even the last brewing of a low-end shu could not be weaker than what was in the Numi bottle. Numi bill the bottled pu-erh as "functional and delicious". Yes, let us enjoy some functional tea. Shu is not an obvious palate pleaser for the coke drinking west. I myself did not initially enjoy the taste of pu-erh even though my first exposure to it 15 years ago was with seriously aged shu at a potter's house in the island of Jejedo. He routinely took monks to China to procure yixing pottery and boyicha -Korean term for pu-erh. (Yes you are thinking, I definitely missed a golden opportunity.) In Korea, Buddhist monks are the serious pu-erh drinkers although the health crazy Koreans have taken it up in the last few years. This original session lasted for dozens of brews developing complex mushroomy medicinal flavors which my then unschooled palate did not enjoy. It's only when I started cutting most sugars and fire chilies out of my diet ten years ago that I really began to appreciate and understand the flavors of pu-erh, sheng and shu. Cutting out the spicy gochujang out of my daily diet healed my tongue to perceive nuance. Cutting out the sugars allowed me to taste the subtle sweetness of puerh. A soda drinker will have a hard time detecting the caramel sweetness of a shu. Back to the photo then. My husband and I also brewed up a small pot of Purple Beauty(Purple Bud Stone Tea) which is a hybridization of Da Hong Pao tea. Our sample was an autumnal pick processed as a sun-dried oolong from YS. You can totally see that the leaves brew purple. As I sadly had a cold and could barely taste anything, my husband vouched for it's unique taste. The usual astringency I associate with purple bud in sheng pu is not present at all, tamed nicely as described. Last week I tried a Da Hong Pao I had forgotten about for five years and it was still a wrong balance of sweet and astringency so it would be great to taste these side by side some time. My mailman delivered a package from Kunming as I was walking out of the door this morning so I took it happily to work. My setup at work is rudimentary, teapot and cup and I don't have luxury of controlled brewing, but it's enough for most teas. I was a bit worried I might be disappointed by the hype but I can honestly say that the GNWL really is a lovely creamy soft tea, refined with a intriguing complexity(for a shu that is...)- kind of like the Audrey Hepburn of shus. I brewed maybe 5 cups and the subtle camphor aftertaste carried all the way through lingering on my tongue pleasantly for an hour after my session. Most of my other Menghai shu blends(7452, 7572, 3rd grade, caravan to Tibet) are on the robust side so this is a welcome change. I was frankly in bit of a Menghai shu rut. I also tried the 2009 Hai Lang Hao Jin Hao Gong Bing Ripe Pu-erh which was a tasty malty roasty cup with a cola licorice flavor. I know another blogger gave the 2005 and 2006 Hai Lang Hao "Jin Hai Lang" a dismissive "leather boot" rating so I was a bit worried but this 2009 Jin Hao Gong was a pleasant experience (or at least not an unpleasant experience). Sadly it didn't last for more than 2 strong brews so I'm not as eager to get more. I expect at least a good 5 cups out of my shu! Is a shu a shu a shu? What is the aging potential in shu? I guess one definitely ages shu to get rid of that funky wodui smell. Of course this doesn't stop vendors from adding the tag line "great for drinking now or put away for further aging". "Aging" promises further magical transformation and not the need for "airing out". 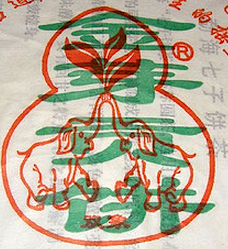 I have ripe pu-erh from 2002 and they do taste smoother and more mellow than younger versions of them selves. I've read some opinions that even lighter fermented shus don't gain that much more depth in age. Should one think twice when being asked to pay top dollar for an aged shu? Most of my shu beengs date from 2001- 2006 when I hastily bought them in 2006 after being unable to drink young shengs without stomach trouble. I did not love the taste of ripe shu as I did of sheng but I didn't want to stop drinking pu-erh so I forced myself to get a stack of premium ripe Menghai blends(7452,7572,3rd grade) and various obligatory Haiwan Lao tongzhis, as well as some CNNP. But you can only drink so much shu so now I have a cache of older shu's(7-10yo) which really needs to be drunk. Shu's apparently can go stale and I guess it is true because my 2001 Feng Qing definitely was tastier 4 years ago then it is now. If anyone wants to trade some shu, e-mail me. Is a shu a shu a shu? I admit there ares horrendous barnyard awful shus, but is there such a thing as a great shu? Is anyone really ever blown away by a shu? The word "amazing" or "mind-blowing" is not what you normally attach to a shu; shu is more like pumpkin pie. I often read tea bloggers praising shu's with a "Pleasantly surprised" designation because the earthiness or pondiness is not as bad as they expected. I think there are some pretty good shu's out there but the flavor variations tend to be small compared to the vast differences one can experience in sheng. Among my ripe cakes, probably the 2006 Menghai Yunnan to Tibet Horse Ripe Puerh Cake is the most interesting with lovely rootbeery/sarsparilla overtones but the other shu's I have had access to tend to have a rather limited palate ranging from roasty, earth, peat, woody, malty sweet to camphor/anise. I finally put in an order for the Menghai Golden Needle White Lotus which has had more gushing on-line than any other shu. If you think there is another mind-blowing shu's to be had, write me! I know I want to try some Boyou's but I don't know if ex-Menghai alum Mr. Huang is replicating the Menghai taste for a lower price or has he gone to innovate? At the end of 2005, I was bitten with a pu-erh mania(only in a small way compared to others) and for the following two years I spent a great part of my free time obsessing over sheng pu-erh. The fascination for me was the complexity and range of flavors one could find in the endless brewings of young sheng. I was hooked by the different physiological effects sheng had on my mental state and I was really chasing beengs that would bring me the greatest mental clarity. But then sadly after two years, drinking sheng took a toll on my system and my stomach could no longer take the strength of sheng. I was relegated to the ho-hum world of cooked puerh. It's hard to get off on tasting just shu so I took a hiatus from the mysterious world of pu-erh and woefully drunk a little shu from time to time. My sheng collection of about 60 cakes has been quietly resting in my tea closet for the last 7 years. I have been using my ipad recently to organize and manage the state of my collection. But in sampling my oldest cakes after five years of hiatus, I now wonder if I should give up home aging altogether. My 2002/2003 cakes still brew light with noticeable astringency- my stomach still complains that even my decade old cakes are nowhere near ready to be enjoyed. Too cold, not humid enough with relative humidity fluctuating between 40 to 60%, the Bay Area is "extra-dry" storage. I fear that the dryness could actually be damaging the cakes. But the thought of giving up makes me too sad so I vow to give it another decade or two. When I was building up my collection 6 years ago, I really knew nothing about pu-erh and I still know very little about it despite having spent thousands of hours drinking, reading, shopping for pu-erh. Now after my hiatus, I write the following reflections to guide my second phase of pu-erh appreciation and you can see I'm still confused and any clarification would be greatly appreciated. It's not uncommon that pu-erh tea drinkers spend more time in ancillary activities surrounding pu-erh (internet research, buying, micromanaging stash, staging and photographing brew sessions, blogging) than actually drinking the stuff. Pu-erh provides the pure sensual pleasures of the brew as well as an endless complexity for the mind but I wish I had spent more time simply enjoying the tea rather than over-analyzing every brew. I agree there is pleasure in the analysis but there is definitely more room for pleasure without over-thinking. During the phase I was building up my collection, very few vendors were offering samples so I had no choice but to buy whole beengs and hope for the best. I never invested in tongs because trying different teas to expand my palate was more important to me than investing in something I already knew I liked. Also who knew how the flavors of a cake would change over time. Even though the specific types which intrigued me most were Nannuo and DeHong purple leaf, I still kept buying different mountains, different factories constantly looking for something I would enjoy more. Because many experts had stated that strong teas age best, I went for a few Banzhang beengs although I question if some of them really are pure Lao Banzhang. Hai Lang Hao definitely must be pure Banzhang as it lives up to the "rocket fuel" designation where as the Douji Banzhang feels too muted to be a Banzhang. No one really knows how single mountain cakes will age since most cakes in the 20th century were blended. Perhaps diversification might prove to be the best strategy in the end because no one really knows what will age best. I'll just have to get back to you in another 10-20 years. Maybe most of my cakes will be totally weak-assed. But really, even if a few cakes out of 60 end up being winners, I'll be happy. And if most of my cakes age into something flat and very boring, I will just stick a few young sheng leaves to liven things up. It's good to have low expectations so you may be pleasantly surprised. The one aspect I love about pu-erh is that these cakes are slowly aging with me and we've already gone through some tough years together. It's not only that your sheng will age in ways you can't predict but your own palate may change as well. You do not know that you might not like the mushroomy earthy flavor twenty years from now or you might find camphor notes unpalatable. But then again, you may start enjoying those flavors in another decade of your life. I think these cakes have better potential than that wooly sweater in the closet you never wear but may come back into fashion some day. I really really should have preferred stone compressed over hydraulic. I had read that iron cakes age better and so I bought mostly iron cakes but this advice may be for wetter regions like Hong Kong. Since I live in a non-humid climate of the Bay Area, looser compression definitely was the way to go. My stone cakes(from Douji, Changtai, Fo Cha Ji) appear to have aged somewhat faster than my iron cakes. The second reason to prefer stone compression is much more practical- sampling from iron cakes is just too painful and broken leaves unavoidable. But most importantly, stone compressed cakes tend to be made by smaller outfits and this preference alone would have helped me avoid mediocre cakes from the giant factories. I have no shortage of of Haiwan, Xiaguan, 6 FTM cakes I'd rather not have bought but big factory cakes were what was most available to me at the early stages of my collecting. Really I resisted buying a Haiwan Lao Tong Zhi for a very long time but the more I saw them everywhere the more I felt obligated to have one just for reference. Universal wisdom is that non-plantation leaves taste more complex and age better so I did try to find cakes which were purported to be Wild Arbor, gushu, or qiaomu. Even advice this simple leaves me at a loss because I've also read in the First Step to Puerh that the cakes from the Communist times(Hong Yin and Lan Yin) are purported to be only plantation leaves. I have no way of knowing what percentage of a cake labeled "Wild Arbor" really is "old" and then there is the quality of the old tree leaves to contend with. Do big factories such as XiaGuan, Haiwan, and 6FTM which have premium cakes labeled Old Tree use a lesser grade old tree than smaller productions even if the price is same or higher? Are inferior old tree leaves still to be preferred over top quality plantation? Will pure wild tree really age better than a blend? Answers! Answers! My noodle is still all bent out of shape because I can't seem to grasp onto any truth in this endlessly fascinating topic. 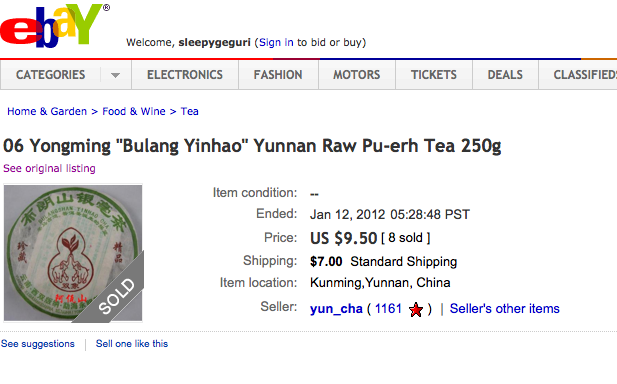 The one aspect I loved about pu-erh was the fantastic virtual community of tea drinkers. In 2007, bearsbearsbears brilliantly hosted a LiveJournal mail-in tea tasting to which I was lucky to be part of. I wonder if all the original members are still actively pursuing pu-erh, I know some of them stopped blogging because life happens and it really takes fortitude, dedication, and free time to be blogging about tea. I still have an unopened stash of the Mandarin's vacuum sealed tea which I purposefully did not open because I was curious about the effects of aging under a completely sealed environment. I still have enough of the samples left so perhaps I can get the old gang together to do an aging comparison! My husband brewed me a sample of the 1999 Mangshi melon Phyll had sent as part of the Live Journal tasting so many years ago. Ah, we were young then, hopeful too. After a hiatus of many years, I am carefully trying out my oldest shengs to see if my body can take it and see if any of my cakes are finally ready! Ironically enough when I started drinking puerh, I was not interested in the taste of aged cakes- it was the dynamic forceful flavors of sheng I really loved so I did not bother chasing old cakes or shus. 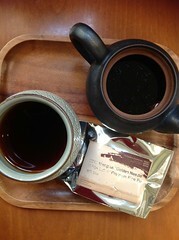 Sadly my stomach is a bit ripped up even with the 13 year-old sample so I have no choice to brew up a big pot of shu. My 2001 Feng Qing Ripe which I remembered being more lively back in 2007 now sadly tastes a bit flat, or is it that my taste buds have been dulled over the years. (I had forgotten that I had this cake as it stuffed was way back in the tea cabinet....) Although cooked shu's do their job adequately, it's hard to find a reasonable shu which has satisfying complexity and aftertaste. I added just a wee bit of the leftover Mang Shi sheng leaves to my shu tonight and to my delight found it added a spark. I wish I had done this years ago as it really perks up the most boring of shus giving it a more interesting camphor dimension and a long lasting after taste- it's been an hour and I still have the sweetness on my tongue.